This log spells the end of the Gallard iron mission chain, and not a second too early. Now I can move on to some other monster, or maybe leave Arkadia altogether and explore what else the universe holds in stock, if that opportunity comes up. Documenting this log frustratingly got screwed up with me interrupting my sole focus on swunting Gallards to enter the Gold Rush event. The Universal Ammo count definitely is off by some 40-70 peds, the Weapon Cells and BLP numbers seem rather wonky too, though I have no clue what happened there. Those last two are incorrect either in this, or the previous Gallard Hunt II log. As a consequence, I definitely will create a cover-all log form before starting my next run. This must not happen again, as it's a massive loss of time if one element of data ruins an entire log. 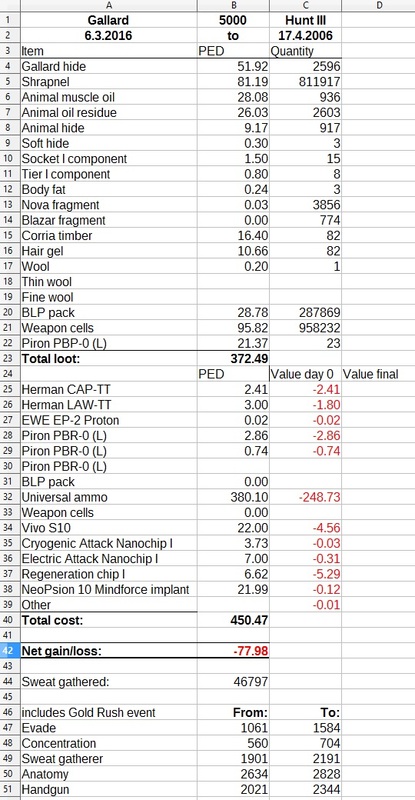 This log is basically worthless in terms of calculating my total loss on this hunt. 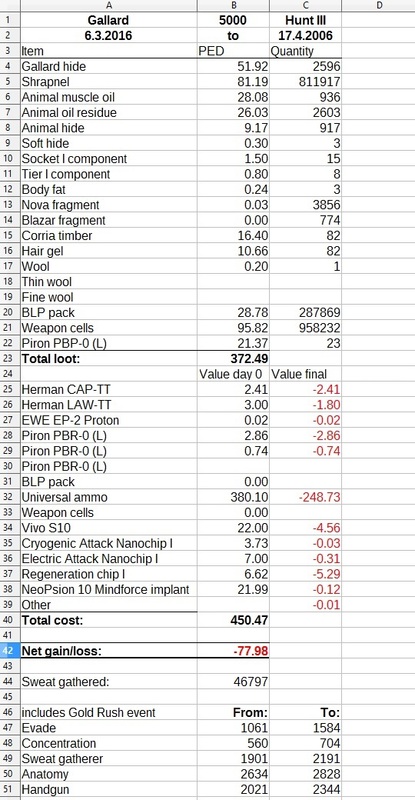 All the other loot values definitely are correct (plus minus a few PEC with the handgun drops). Side note: Sweat gatherer level gain has slowed down considerably, but still is increasing motivatingly enough for me. I sold 20k sweat for around 1.75/k at some point.